Then, when you finish what you are reading come back and take a Challenge, tell the BFWP readers all about the book. 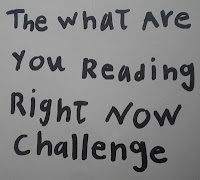 Click to read past What are you Reading RIGHT NOW Challenge comments. I am reading a bunch of books right now and decided to take a challenge on each of them RIGHT NOW too... to read my comments about each book, click the link! Mom loves the book (She says it is one of her favorites lately)--I will tell you what I think when we are done! Children of God, by Maria Doria Russell. Having just whizzed through The Sparrow, it's pretty hard not to become drawn into this sequel. The setting and characters are drawn vividly. While the characters are engaged in daily things, they are conststantly grappling with things of eternity. Like lava lamps, the undulations of these two levels are irresistible. A great read. Just picked up the next book of Ralph Moody's Little Britches series...Fields of Home. I can't rave enough about how the man sweeps you into his tales of boyhood and just keeps telling one rich tale after another. And...I'm happy to state, now that the snow has fallen in Northern Michigan, that I am starting the "read three books at one time" routine. One blessing of winter! So, thanks to the wonderful contributors to this project, I'm starting Great Books and Dreamers of the Day. Today. Copies of Barack Obama's book, Of Thee I Sing, arrived at my doorstep this evening and I've already read it through twice. It is a lovely book. It is a loving book. It is a gentle book that focuses on the reader rather than the 13 Americans who are mentioned as examples of qualities that we share as humans and as Americans. It whets the appetite, perhaps, to learn more about those mentioned, but really calls on us to recognize and appreciate those qualities in ourselves. It isn't what I expected but I'm not disappointed. I think it's to be shared and cherished. Enjoying the storyline and main character, although she reminds me of Oprah! I am reading Socks by Beverly Cleary.Socks is a cat.He was adopted by a couple. After they had a baby he had to get accustomed to having a sibling. I am reading Thoroughbred,A Horse called Wonder,by Joanna Campbell.Ashleigh has a older sister named Caroline and a younger brother named Rory. They went to look at horses because her horses died. She had a foal and a mama horse that died. I'm interested to see what happens next. I love horses! And Sis, we love horses the book sounds great and Socks sounds like fun too! I am reading The Secret Garden by Frances Hodgson Burneet.There was a girl named Mary.Everyone called her mistress Mary quite contrary She went to her uncle's place because her parents died.She got big when she was there and met a boy named Dickon.They found a garden.She found another boy and his name was Collin.They all went to the garden.The more they went to the garden the healthier they became. "...At a Gospel Mass in New Orleans recently, the preacher invited each one of us to to turn to our neighbour and say, 'Something good is going to happen to you." It made me realize that there are such beautiful bouquets of words that we never offer each other. For days afterwards, I could see the chubby face and hear the gravel voice of the little boy next to me saying, 'Somethin' good's gonna happen to You.' His words became a kind of mantra that blessed me for days." I thought to myself what a blessing it would be to walk around each day with that in mind. It seems to me it would make us more aware of the miracles in our daily lives that we blithely ignore. I'm going to try saying that to someone every once in a while. I guess I'm a little eager to get reconnected! I finished reading Eternal Echoes a couple of days ago. It was not something that could be read quickly. At the end there was a list of suggested further reading and one book leapt out at me. It was Exile and the Kingdom by Albert Camus. I didn't remember reading it when I was in my Camus stage, but I went to my bookshelves and there it was. I took it down and began reading and read it straight through! And now I am going back to read The Stranger which I haven't read for at least 40 years. It's amazing what a really great writer will do for you. HAPPY NEW YEAR, BFW family! Happy New Year to you too, Dear Lynn! It is wonderful how taking a little time off of a project can renew the energy... and we have all been reading more! Tomorrow a new challenge from The Bean and The Sisters have some surprises up their sleeves too. I will post a few more soon. Have to get to work on tomorrow's Challenge! Well I'm really mostly rereading AMAZING books right now. I've worked my way from book 5 to 7 of Harry Potter even though I have read them a million times u can't get enough of a good book! And These aren't good, there AMAZING! I am reading Fantastic Mr. Fox by Roald Dahl. Mr. Fox out smarts three farmers and saves his family and their friends. In this story the animals are smarter then the people. All three books are satisfying and compliment each other well.